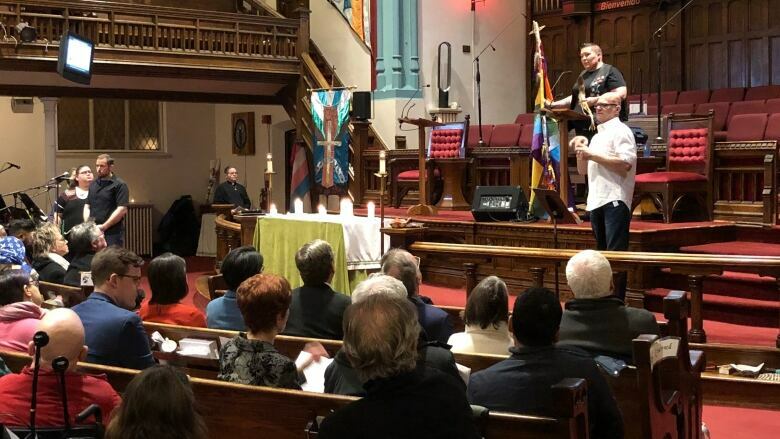 Toronto residents gathered Sunday evening to pay their final respects to the eight men killed by Bruce McArthur and to come together in love and peace so that they can "heal this hurt together." The "Vigil for a Grieving Community" at the Metropolitan Community Church of Toronto came after McArthur was sentenced Friday to life in prison for the killings, which took place between 2010 and 2017. The vigil included Hindu and Muslim prayers, a reflection of the fact that many of McArthur's victims were of South Asian or Middle Eastern descent. Rev. Deana Dudley, an assistant pastor at the MCC who gave a victim impact statement at McArthur's sentencing on behalf of the LGBT community, described a difficult year marked by ongoing heartbreak. One bright spot was the fact that people came together, "to give comfort and support to one another, to search for missing men, to demand justice, to replant a garden, to mourn and to bury our dead and to share our grief and share our strength." But, she added, there is more work for the community to do. "We can never guarantee that nothing like this will ever happen again. Our hearts may break again. And again. And again. But the way we fight this kind of evil is by creating a kind of beloved community where evil cannot hide in plain sight because we care for one another." McArthur received a life sentence, with no chance of parole for 25 years, after pleading guilty to eight counts of first-degree murder in the deaths of Skandaraj Navaratnam, Andrew Kinsman, Selim Esen, Abdulbasir Faizi, Kirushna Kumar Kanagaratnam, Dean Lisowick, Soroush Mahmudi and Majeed Kayhan. Nine candles were lit at the vigil: One for each of the victims, as well as a candle for the many others affected by McArthur's crimes. Vigil attendees then lit their own candles from those flames at the end of the service. Karen Fraser and Ron Smith, whose home in midtown Toronto was ground zero for the investigation as it was the place where McArthur buried his victims, attended Sunday's vigil to show support to a community that has shown support to them during the ordeal. Members of the MCC replanted their garden after it was torn up by investigators looking for the victims' remains. "You don't run from something like this," Fraser said outside the church. "If you run, then the bad stuff wins." Smith said the couple tries to keep the feelings of the victims' friends and family members top of mind. "We were mildly inconvenienced by comparison with what they're going through," he said. "And we keep that in mind every day." "Tonight's vigil will really mark, I believe, the beginning of the healing process," Rev. Jeff Rock, senior pastor at the MCC, told CBC Toronto ahead of the vigil. At the beginning of the vigil, he said he hoped members of the community would "find the comfort you seek" during the proceedings. "We are resilient, we are strong, we are full of love, and we will remember those we have lost," he told mourners. "We will heal this hurt together." For members of Toronto's LGBT community who found last week's hearing difficult, Rock said before the vigil that it "feels like only now can we start to move forward. 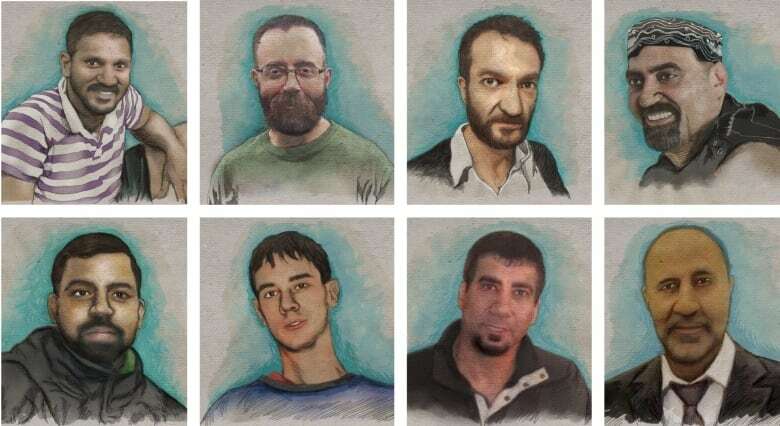 After these heinous crimes, it's a feeling like our safety has been shattered." Rock also said people in the city need to do better to address racism and to ensure LGBT people are accepted in all communities. "This crime is a reminder that perhaps we aren't as safe in our own city as we'd like," he said. "The commitment is to come together — people of different religious backgrounds, racial backgrounds, gender and gender identities, sexual backgrounds — and together commit to making our city safe, to speaking openly and honestly about sexuality so people don't need to be closeted," he said, noting that McArthur targeted people who might be difficult to track. The MCC, which can accommodate up to 600 people, held its first vigil last year, after McArthur was arrested. Sunday's vigil was aimed at creating "a safe place for people to shed tears and grieve," Rock said, "and to make the commitment to move together forward in love." Donations collected at the vigil will be given to the Alliance for South Asian AIDS Prevention.